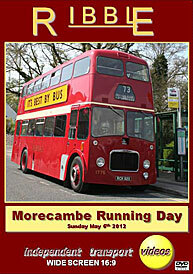 The independent transport videos cameras were very honoured to be invited to film the second Ribble Morecambe Running Day that took place on Sunday 6th May 2012. The event organised by the Ribble Vehicle Preservation Trust was centred at the Winter Gardens on the Marine Parade in Morecambe. Our filming starts bright and early on a beautiful spring morning with the arrival of the buses to be used in service and also vehicles that will be on display on the promenade. We film the first departures and also inspect the display vehicles which include the impressive Bristol VRL double decker coach, 60 (LRN 60J) and Marshall bodied Leyland Leopard 665 (DRN 665D) that came over from the Isle of Man for the event. Not part of the running day, but a superb addition to the day was former Morecambe and Heysham AEC Regent III open top 62 (KTF 591) now operated by the Morecambe Heritage Bus Company . It runs in service along the seafront from May to September and wears a similar livery style to Lancaster Borough Council in the 1970’s. We take our first journey of the day on board Ribble Leyland Titan PD3/5 with MCW full front body 1775 (RCK 920) from the Winter Gardens to Heysham village. From here we stay on for the full service 73 to Carnforth via Morecambe. You can enjoy the sights and sounds of this excellently restored bus as we travel along the beautiful coastline to Carnforth. At Carnforth we take a brief look at the railway station that was made famous in the 1945 David Lean classic film “Brief Encounter”. If you saw the film you will remember the clock and the tea rooms – well it is all still here today for you to enjoy – only the steam trains have gone! After filming 338 (NCK 338J) a Leyland engined Bristol RESL with ECW body running through the town we join 1775 again for a ride back to the Winter Gardens. Look out for the canal on a level with the top deck of the bus! With more filming completed at the Winter Gardens we board Leyland Atlantean PDR1/1 with MCCW H77F body for another ride on service 73 to Carnforth. Again more enjoyable sights and sounds of the Leyland engine and more action on arrival at Carnforth. We travel back to Morecambe on 2101 (GFR 101W) the second Leyland Olympian ONLXB/1R to be built. It has a 77 seat ECW body and has recently been restored to as new condition. Back at the Winter Gardens we film the vehicles in action along the promenade. There is plenty of variety with associated fleets from the North West of England such as Fishwicks, Lytham St. Anne's, Barrow Corporation and even a Bristol L coach from Royal Blue. An excellent event and a big thank you to the Ribble Preservation Trust for organising the day. Enjoy!